Supplementation for those who refuse to eat offal? I will not eat offal. FORGET IT. I can walk around barefoot and grunt and pretend to be a caveman, but I can not stomach the organ meat. Is it my fault that I'm a product of a prosperous society in which it's easy to get by eating only muscle meat from childhood onward? No, it is not. Now, if I'm going to eat VLC to promote weight loss, for me that means mostly muscle meats (beef, pork, lamb, some chicken, some seafood), some eggs, some cream, some butter, a few almonds, and some well-cooked cruciferous veg for "color." I do better without the cheese, so I avoid it. So the question becomes: a) what am I missing eating this way and being a picky little hunter-gatherer, and b) how to I supplement to make up for that? Be careful not to overcook it! Ha no doubt! Believe me, I feel your pain, I cannot stand the taste of liver, but I try to eat it 2-3 times a month. Usually involves the recipe above or paired with avocado, chili sauce, and melted raw cheese to help cover up the liver taste. Yes, I do a yeoman's job of eating butter, cream, and fatty cuts - it's tough work, but I slog through somehow. Ok. Just because you make a compelling case, I'll pick up a liver from the farmers market this weekend and give it an honest try. Anything involving onions and butter can't be that bad. Ok, I'll cop to eating sausage, but it's probably not more than once a week. You don't eat sausage or hot dogs? Most people are eating more offal than they realize. I'd definitely recommend finding a good butcher. They might be able to custom make some bratwurst with liver blended in or something, so you really can't taste it. But good bratwurst is basically offal. A good pate is another entry offal. Chicken and other bone broths also contain much of the good stuff offal has and are delicious and inoffensive to nearly everyone. I think what you'll be missing is minerals. 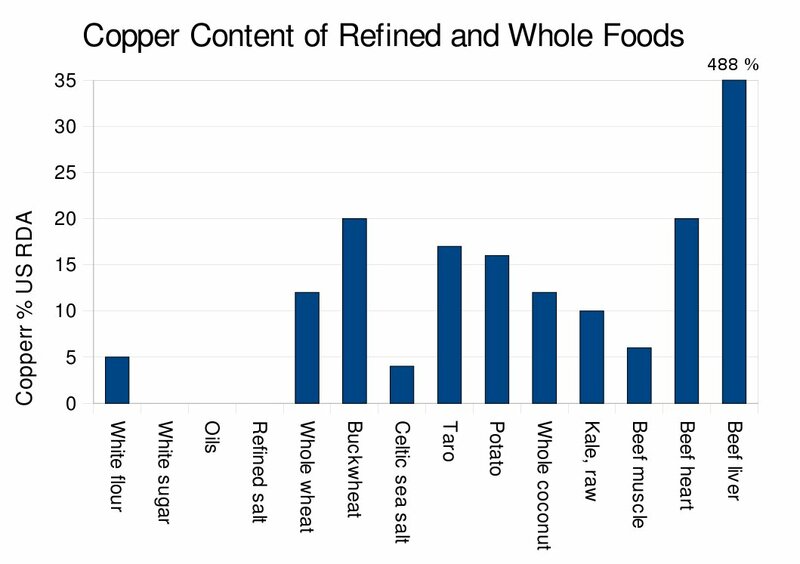 Steve Guyenet has an interesting post on copper http://wholehealthsource.blogspot.com/2010/04/copper-in-food.html which includes a graph showing beef liver has 8 times the amount of copper as beef muscle. I haven't seen similar graphs for other minerals, but I expect there is something similar for various organ-mineral combinations. There is also a possibility that primarily eating muscle puts more protein than you really need into your diet. Fatty cuts and 20% ground beef can help to address that; as well as cream, butter, avocado, coconut, etc. I know you don't want to eat it, but calf's liver has a little better taste than beef liver. Cook with onions, garlic, sweet potatoes, swiss chard and a whole lot of butter. MMMM!